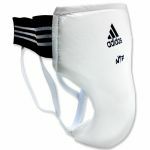 For those looking for the best groin protection available, the Adidas Male Groin Protector is second to none. These WTF approved groin guards are made of ahard plastic groin cup covered with layers of foam padding and vinyl. The groin protector features a sturdy elastic waistband with a double Velcro connector in back to properly adjust to the right size. One of the things that is unique about these groin protectors when compared to your standard cup and supporter is that they can be worn underneath or on the outside of your uniform. 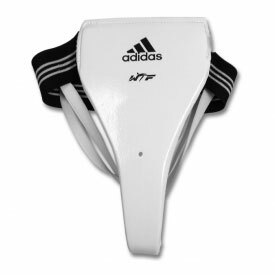 Many martial arts schools choose to wear these groin protectors on the outside of the uniform because they can easily be put on prior to a sparring match or practicing your ground techniques. Can be worn underneath or on the outside of your martial arts uniform. Constructed from a hard plastic shell covered by foam and durable vinyl.